Our condo is situated at Lighthouse Landing Condominiums, nestled in a quiet cove with a great view of both the channel and Bagnell Dam from the screened porch. Pets are NOT allowed. No Smoking in Unit. 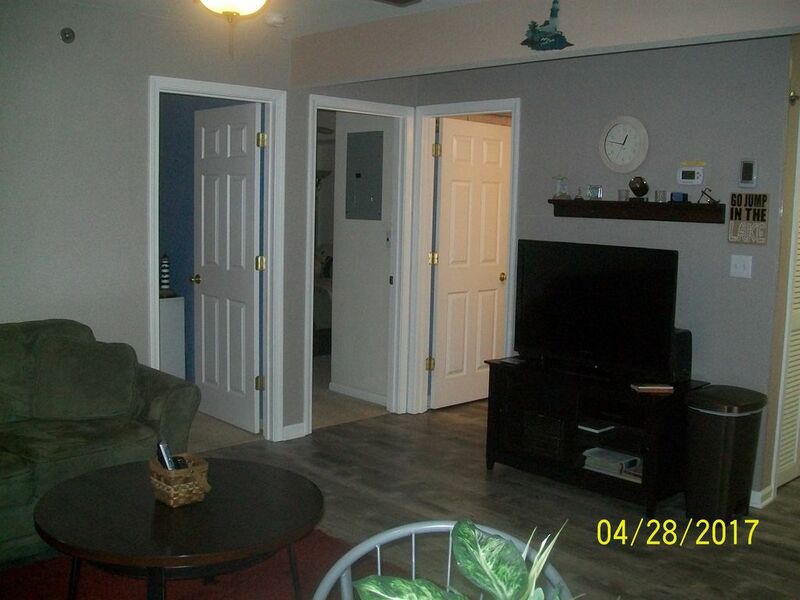 This Condo offers a pleasant decor. It is great for both Adult and Family get-aways. The Master Bedroom has a king-size Bed with an adjoining private bathroom. The second bedroom has twin beds with an extra television and cable... Great for the kids even in rainy weather. We have had many happy guests, many of which have become frequent visitors. We hope to add more to our list of happy guests. We liked the area for the quiet cove location and the convience to all activities. Lake of the Ozarks 52000 surface acres of water. 1300 miles of shoreline. Living Room has flat panel t v with Spectrum Cable and blueray player with Netflix and other apps. Has everything you need for a small or large meal. 40 inch flat panel T V in Living Room With a blue-ray player that streams Netflix & Youtube. Guest Bedroom has flat panel TV and DVD Player. Fully Screeened porch with morning sun and afternoon shade. Comfortable seating with a gas grill. Great rental property. We really enjoyed it! This is a great place in quiet cove. Ed does a great job of communicating with you and is great to work with. Unit is very clean and well taken care of. We will definitely use it again. The condo was clean and conveniently located. Ed and Tammy were always available to answer questions spur of the moment, day or night. Yearly trip to the lake with my best friends! We have been renting from Ed and Tammy for 15 years and love their condo. They have always updated something every time we go. Condo is always clean and we really like the screened in porch. Ed is always accommodating with any questions we might have. Thanks Ed and Tammy for letting us rent your condo! This is my #3rd time staying in this rental and each time is better than the last. I make new friends and am able to relax to its fullest while my kid and friend get to make the short drive to all the activities the lake has to offer. Will continue to utilize this location as long as I can as I love being here, and the owners are always very diligent on making sure everything I need is available. The condo was perfect for the four of us and the view over looking the lake was great. It was well equipped with kitchen and bathroom supplies. The beds were very comfortable. We could not have wanted more. We hope to return in the future. Go-carts, Arcades, close to Bagnell Dam Strip, close to boat & jetski rentals and parasailing.